less energy than conventional models without sacrificing features or performance. They do this by using innovative energy saving technologies, such as moisture sensors that detect when clothes are dry and automatically shut the dryer off. 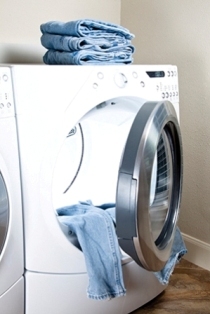 Many ENERGY STAR dryers also include convenient features, such as steam cycles that can help save time on ironing clothes by preventing wrinkles. New Jersey's Clean Energy Program offers a $100 or $300 rebate on the purchase of select ENERGY STAR qualified clothes dryers. If you are buying a clothes washer at the same time - don't forget we've got rebates on those too! A $50 rebate is offered to residents who recycle their old, working refrigerators or freezers through New Jersey's Clean Energy Program. Check out the refrigerator and clothes washer rebates.